Creating QFD with free templates and examples. QFD has never been easier. Quality function deployment (QFD) is a tool used to transform customer need into engineering characteristics for a product or service. QFD was first developed in Japan in the late 1960s as a form of cause-and-effect analysis. QFD is applied in a wide variety of services, consumer products, military needs, and emerging technology products. When you are working to determine what you need to accomplish to satisfy or even delight your customers, then the tool of choice is quality function deployment or QFD. QFD is designed to help planners focus on characteristics of a new or existing product or service because QFD provides a system of comprehensive development process for understanding how customers or end users become interested and satisfied by carefully listening to the voice of the customer and then effectively responding to those needs and expectations. 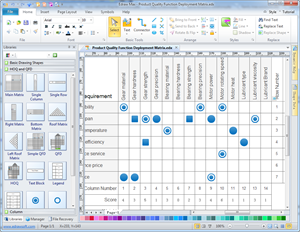 Edraw is a powerful but easy-to-use software help you create Quality function development easily. With its intuitive interface, easy-to-use drawing tools and lots of pre-drawn library objects, Edraw manages to provide you with solution that meets any requirements of diagram designing. Just simply drag and drop the shapes and customize your drawing with Edraw automated tools. 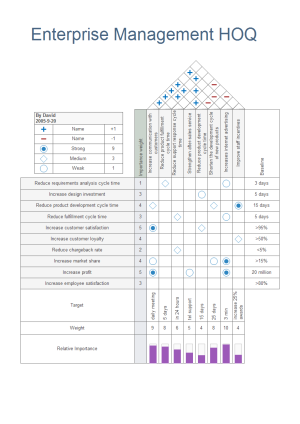 You will finish a professional-looking Quality Function Development diagram in just minutes. 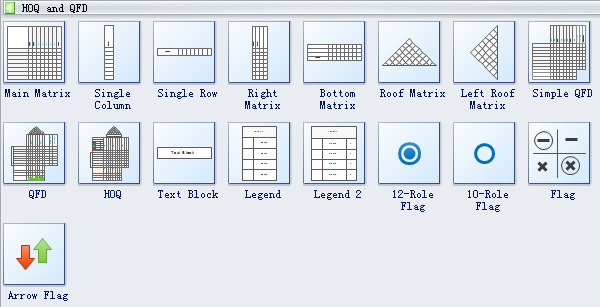 Edraw QFD templates provide you plenty of special shapes used in the QFD charts, main matrix, single column, single row, right matrix, bottom matrix, roof matrix, left roof matrix, simple QFD, text block, legend, 12-role flag, 10-role flag and arrow flags, etc. With these special shapes, your QFD chart will look more professional. We spare no effort to create qfd templates like this one to improve our service quality. Try it to verify its effect in your own designs.